TurtleSkin SnakeArmor Snake Gaiters are the lightest snake bite protection leg gaiters available and weigh just 6 oz. each. Many snake gaiters on the market are not foldable, however if you are backpacking or want to save storage space, you'll appreciate that the Turtleskin SnakeArmor brand folds to approx. 8 x 8 x 2 inches. TurtleSkin SnakeArmor Snake Gaiters are the lightest gaiters available (6 ounces each leg) and feature a rust-proof zipper with cinch cord to get the best fit over pants. Made with a tight weave of high-strength layers, these snake gaiters are cool, comfortable, water resistant, and flexible. They can also be folded for use in backpack or for storage. Folded size is approx. 8 x 8 inches. Regular size: 20" Top of Calf, 17" Ankle, 16" Length. Khaki (tan) color on both sides. Tested with live rattlesnakes! Warranted by manufacturer. Made in the USA! Protect yourself against snake bite while in the desert or woods! If you have any questions about this product by TurtleSkin, contact us by completing and submitting the form below. If you are looking for a specif part number, please include it with your message. 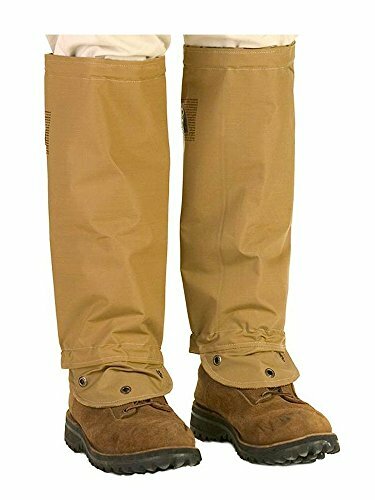 Waterproof Leg Gaiters Boot Shoe Cover Legging 16"